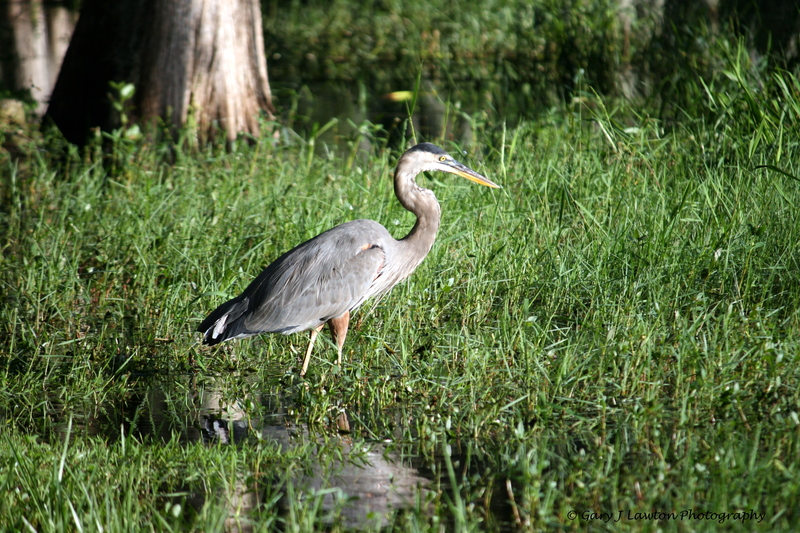 Great Blue Herons stand over 4 feet tall and have 5 foot wing spans. It was a beautiful spring day along the Connetquot River on New York’s Long Island. The crisp morning air was washed of smog from spring rains that fell overnight. Raindrops, caught by the spring growth of swamp maples, black gums, and viburnums, glistened in the morning sun. As I walked along the edge of East Pond, one of several ponds that are part of the Connetquot watershed, green frogs leapt off the narrow trail into the water. A water snake, sunning itself on a patch of sphagnum moss, slithered into the water when it saw me draw closer. Mallard ducks, wary of my presence, paddled to the opposite side of the pond as a chatty kingfisher bird dropped to the pond to pick off a small fish. The woods were alive with the singing birds. Common yellowthroat warblers, small birds that with black masks around the eyes, blurted out “witchity-witchity-witchity”. Yellow warblers, all yellow with breasts with rusty streaks sang “sweet-sweet-sweet, sweeter than sweet”. This was all music to my ears. I paused when I heard tapping coming from the top of a dead swamp maple tree, stripped of its bark by weathering, insects and wildlife. Several holes, at varying heights, revealed the rotten inside of the tree where woodpeckers carved out the soft wood to raise young. Near the top of the 30 foot tall tree was a hairy woodpecker. It was working its way around the tree trunk tapping at various places, probably to extract insects from the dead wood. As I continued my walk, my mind drifted off to a time a hundred years ago when this property was owned by a sportsmen’s club. Members of the club included the who’s who of the late 1800s and early 1900s. Did members of the Roosevelt family hike this very path to fish and hunt here? If so, did they enjoy the peace and tranquility that I am enjoying now? If I met the Vanderbilts, would… “Sqaaaawkkkkk.” A shot, no, a pint, of adrenaline streamed through my body. I felt it in my arms, legs, and head. My heart pounded my chest. I don’t know if I temporarily stopped breathing at that moment or not. “Sqaaaawwwkkkk.” What the…???? I looked up to see a pterodactyl-like creature rise up. Its 5 foot wingspan nearly engulfed me. I felt the rush of wind as it rose up off the path. I froze, the adrenalin coursing through my veins. It was a great-blue heron that, in my daydreaming, I did not see until I turned around a bend in the trail to find myself suddenly upon it. This 4 foot plus tall stork-like bird was as surprised to see me as I was to see it. Its adrenalin pump caused it to flee, not confront the 5’ 8” animal that was upon it. The harsh squawk startled its potential predator, me, long enough for it to get away and it worked. I froze, first because of the loud shrieks, then because of its 5 foot wingspan. Once I recovered from the blast of adrenalin, I continued on the path, more vigilant of what was on the trail. Frogs continued to jump into the water, birds flew away and turtles slid into the pond – all to escape what they perceived a threat to their well-being. I thought about what is must be like to be a rabbit, a mouse, a frog – the hunted. The adrenalin rush that I experienced just moments ago, must be a daily occurrence for the hunted. The trail led me back to civilization and at that moment I was glad that I was a human, an animal on the top of the food chain and not among the hunted. ← What do Birds do During a Hurricane?